It a cold dreary nite. The moon is full and the Wolves are out for blood. Blackblood to be specific. After the intrusion into their peaceful forest homes, the Wolves have regrouped and are looking for revenge. They set out to restore their honor and redeem their name by attacking the dreaded Blackblood in their own keep " Castle Compton". Honor will only be satified by capturing the Alchemist, that stayed back and commanded but took no part in the slaughter, and seeing him swinging from a tree with his flesh FLAYED from his body. Yes my dear listener, put the children to bed, because tonite is the story of the Wolves Blood Moon. Wolves - within seven turns have more points inside Castle Compton than the Blackbloods or Get in base to base contact with the dreaded Alchemist thus capturing him and preventing him from calling reinforcements. Blackbloods - Hold off or repel the invaders long enough for your rear guard to arrive Turn 8.
unit 6--Blood bone flayer leader and 5? flayers. Total was 1500 and some change. in their humble forest homes. The Blackbloods won initiative and forced the Dwarves to deploy first. 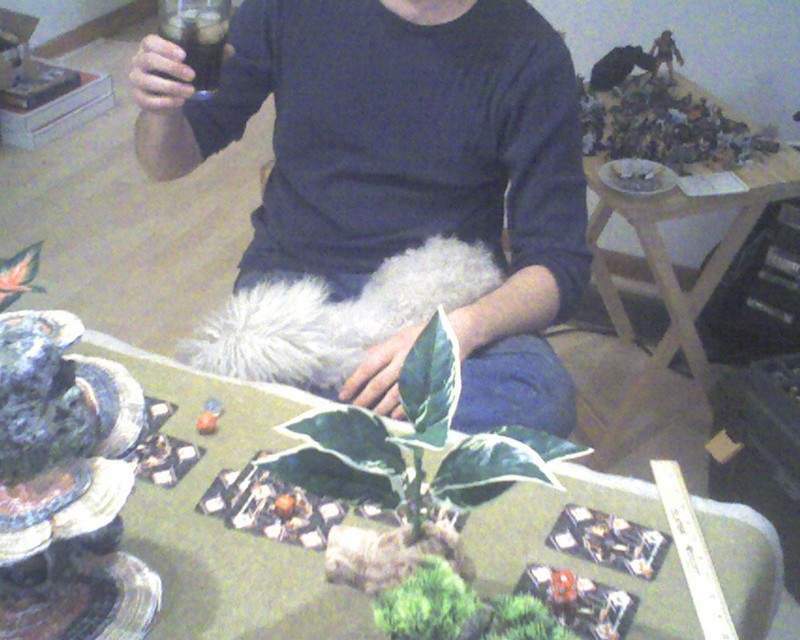 Josh needed a drink to fortify himself for the battle. The Dwarves cackled with glee thinking that they would get to command the board. Little did they know, that coming from the hills was a force like they had never seen. The Dwarves were unscathed at the end of the deployment phase, the last such time that statement would be true. 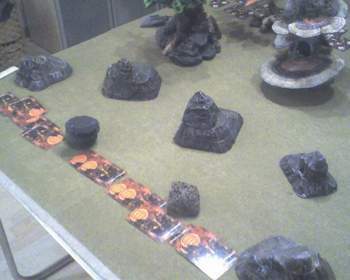 Upon winning initiative, the Dwarves decide to invite a middle invasion by massing to defend the edges of their village. When in a display of bravado and derring do, the Goblin chariot charges across the field to attempt to tear them asunder. The Dwarves are totally unprepared for the audacity of the strike. Upon winning Initiative, they have a choice to make...Do they unleash the Totem on the Chariot or do they allow the archers to take it out. The archers choose to fire without direction. The choice was a fatal one, as the rain of arrows fails to stop the Chariot. 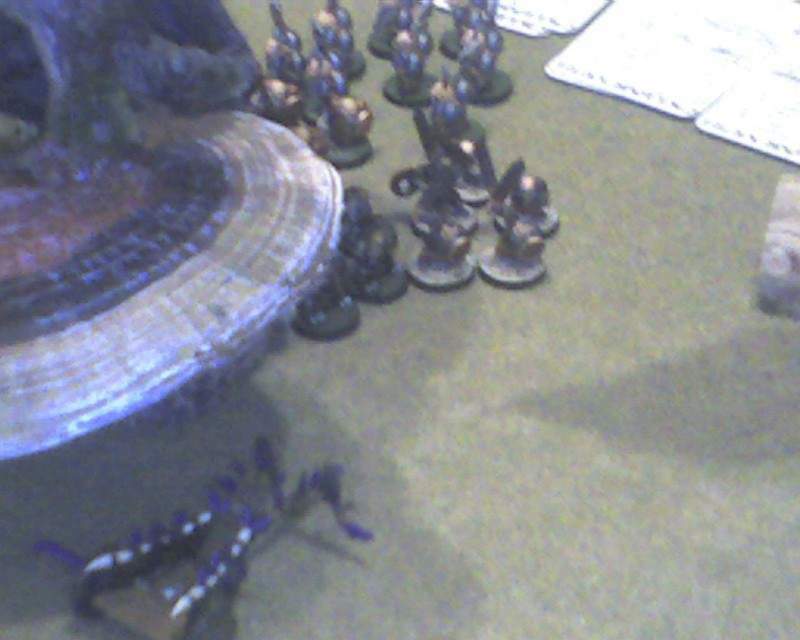 The Dwarves are devastated by the trampling chariot. A full third of their defense is wiped out< 417 pts to be exact> before the chariot can be brought down. Unfortunately I got tired of taking pics with my phone at this point, but use your imagination, trust me what you will invision is close to reality. The Dwarves valiantly try to fight on after the massacre. 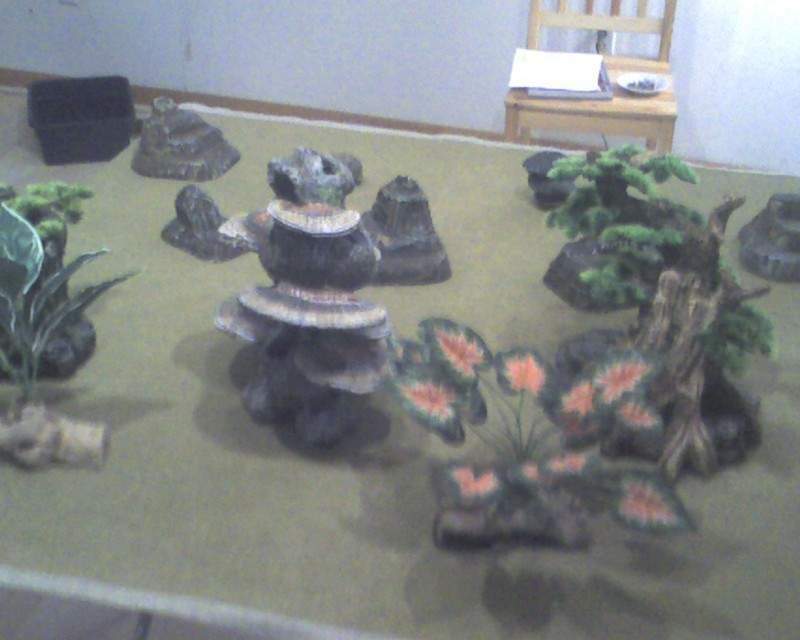 Managing to get the Totems out into the open, reaping vengence for their slain kinsman. The Totems take out the Kutara, a warband of Crimson Blades and most of a warband of Swordmaster before being brought down by arrows and the remaining Swordmasters that were rallied by the Troll. At that point the archer´s superior position begins a war of attrition. 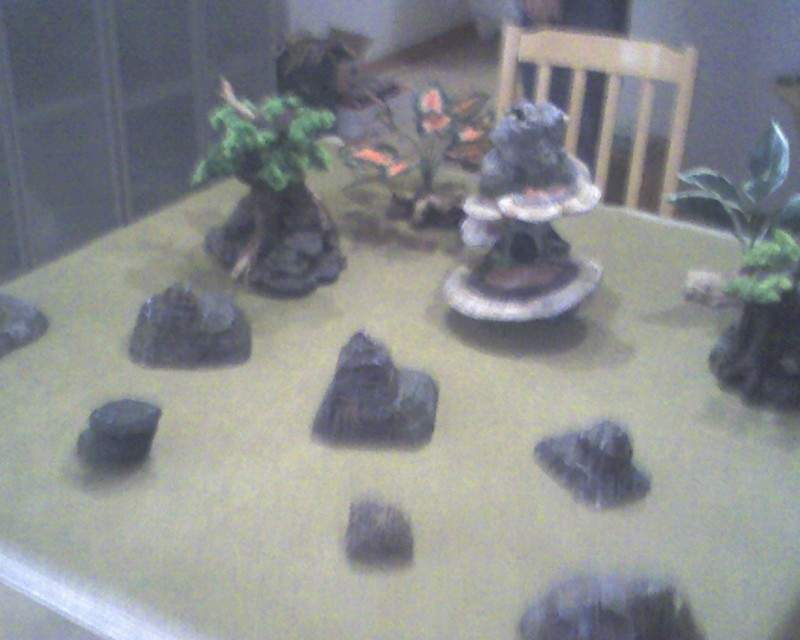 The Dwarves couldnt reach them before they were cut down to near useless. Using uncommon wisdom Grin Their leader Josh the Mighty calls for a retreat, to live to exact revenge another day. The Blackblood leader Philly of Sniper, having proven his point, Allows them to run and accepts the white flag of surrender that was waving from the tail of their white lap-sitting totem mascot. Im sure Josh will add his input when he gets on the comp in the AM.